Nagarjuna is undoubtedly one of the most handsome actors in Tinsel town, and one wonders what his skin care secrets are. The actor has recently joined the sets of Manmadhudu 2 taking shape in the direction of Rahul Ravindran of 'Chi La Sow' fame. Nagarjuna looks uber cool on the sets. The pics from the Manmadhudu 2 set posted on social media have certainly brought positive vibes. 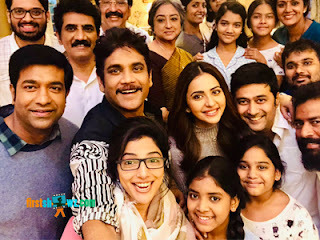 Besides the lead stars of the movie Nagarjuna and Rakul Preet Singh, Manmadhudu 2 also has Rahul, Vennela Kishore, Rao Ramesh, senior actress Lakshmi and Jhansi in supporting roles. Manmadhudu 2 is being bankrolled by Manam enterprises and P Kiran’s Anandi Art Creations. Manmadhudu, a romantic entertainer is one of the biggest blockbusters in Nagarjuna's career which was released in 2002. It was also produced on Nag's home banner Annapurna Studios, while Vijaya Bhaskar directed it, and ace director Trivikram Srinivas penned story, screenplay and dialogues.